The unhygienic way of cooking, poor quality of food contents, ingredients, and water used, are few major causes for Food poisoning. Either infectious or toxic agents will cause food poisoning. The pathogenic bacteria contents in food with other microbes infect our body is one type and in the case of contaminated toxin produces by the food, ingredients or other is another type of food poisoning. The viruses, parasites, or prisons are the various causes to contaminate the food and become poisonous. A few symptoms of food poisoning are vomiting, diarrhea, nausea, pain in the abdomen, gastroenteritis, fatigue, and fever. Sometimes it may cause semi-permanent or permanent health problems. Nevertheless, we cannot discard the death in some cases of food poisoning. The high risk involved with babies, pregnant women, aged sick patients, and weak immune persons. Few times the food poisoning may not react immediately, takes some days. The food poisoning can be diagnosed by blood test, food test and stool test and proper treatment extended. Many times diarrhea may cause dehydration and leads to critical conditions also. 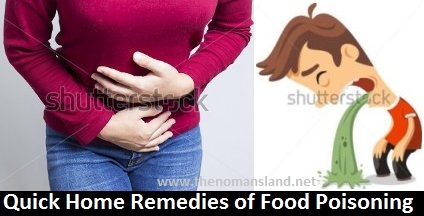 Generally, the food poisoning patient treated for two or three days at home for moderate diarrhea with plenty of boiled water, tender coconut water, and fresh fruit juices. It keeps energetic and active. Ginger: Add one spoon of Ginger juice with one spoon of honey mixed with water, cures in digestive problems. You can also feed raw ginger slices or ginger tea to set right the upset stomach. Three to four times 100 to 150 ml of juice in a day keeps recovering from illness. Lemon: the lemon juice keeps away virus and bacteria, which is main, cause of food poisoning. One teaspoon of fresh lemon juice added with sugar and little ginger juice make the patient relieved from stomach-upset issues. In any case, do not use packed lemon juice. Keep feeding four or five times of 150 Ml of lemon juice in a day make you fresh. Basil: It is an excellent antimicrobial herb, which is easily available. You can make basil juice added with honey and coriander juice mixed in water keeps improvement in deteriorating stomach issues. To get quick relief, you can feed four or five times of 150 Ml in a day. Garlic: It also works as Basil, keeps antifungal and anti-viral away from the upset stomach and diarrhea. Only the issue with garlic is the bad odder, which keeps everyone little bit away. However, as a medicine, you can directly take one fresh garlic clove or as juice mixed with water to get cured at the earliest. Banana: It is another fruit which clears stomach upsets and rich potassium with energetic. Cumin seeds [Jeera] is one of the home medicine, directly you can eat Cumin seeds, or boil in water to clear food poisoning issues. A Cumin and ginger or lemon or honey mixer of water cures faster and clears upset stomach and food poison issues. Always it is obvious to select the food, preparation, hygienic method, and proper ingredients used. Wash your hands, plate and drink pure water. If you feel and smelt unusual smell or taste, better to stop eating. Nevertheless, avoid packed foods and if you cannot, then check the expiry date and ingredients used. Consult a doctor immediately when you are upset due to food poisoning and take care of the procedure as advised. If it is homemade, prevent children, elders, and sick patients from eating the rotten food. Enjoy good food and enjoy the life.